Today I want to share a few products from the brand Formula 10.0.6, a skincare company that prides itself in using only ingredients that are absolutely necessary to make the best products. The company was kind enough to send over a few products of theirs to test out, and after using them all for the past several weeks I felt it was about time to share my findings. I was able to try out two cleansers from the line, both of which worked perfectly for my dehydrated skin. First up was their So Totally Clean Everyday Cleanser*, a toner and cleanser that's ideal for sensitive skin. Made with ingredients such as Sea Kelp, Cucumber and Chamomile this formula is perfect for sensitive skin, cleansing and toning your face without you having to worry about any sort of adverse reaction. The liquid formula is also alcohol-free so it won't dry out your skin like so many other toners do. This product is perfect for not only removing makeup but also unclogging pores or helping to remove any dirt or grime that might be left on your face. Another cleanser from the line that's still perfect for more sensitive skin is the brand's Best Face Forward Foaming Cleanser*. I'm not usually a fan of foaming cleansers but found the formula for this to be incredibly gentle and effective. It contains ingredients such as Chamomile, Green Tea and Passionfruit, making it not only a great skincare product but also an incredible smelling one. I really enjoy using this in the morning to not only clean my skin but also wake me up a bit. 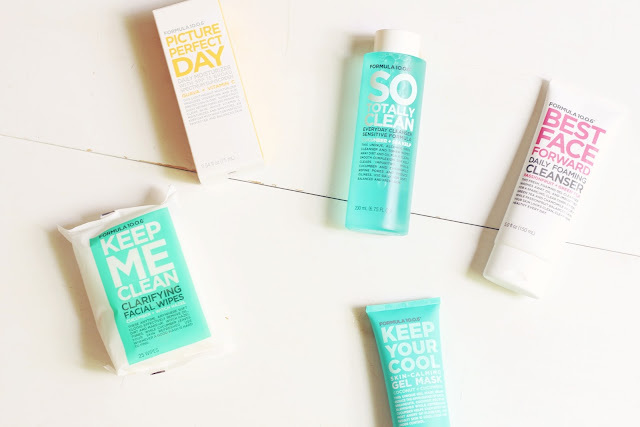 The brand also offers their Keep Me Clean Clarifying Face Wipes*, a packet of wipes soaked in a formula containing ingredients like Salicylic Acid, Tea Tree Oil and Cucumber. The wipes are perfect for on-the-go, and I found the best way to use them is as a quick refresher after exercising or doing any other strenuous activity. I actually brought these with me when Jake and I went out into the wilderness for his work (cause that's how we do it in Minnesota) and I used the wipes as a quick facial pick-me-up throughout the day. The other product I used on that trip was the brand's Picture Perfect Day SPF*, a Guava and Vitamin C infused gel moisturizer that provides SPF 15 sun protection. While often I find sunscreens to be greasy, this guy is just the opposite. The gel formula quickly dries down to a matte finish so I never need to worry about getting too oily during the day, creating any sort of break outs. It's a great option for days when I don't wear any makeup, but also works wonderfully underneath any foundation I might want to wear. Finally, the last product I tried from Formula 10.0.6 was their Keep Your Cool Gel Mask*, a formula containing Peppermint, Coconut and Chamomile that works as a cooling gel mask. Not only is this mask super refreshing to wear but it also helps immensely at easing any redness or breakouts I might have. The Peppermint in the formula is really what creates that cooling sensation, and this mask has been a favorite of mine on these hot summer days.